We have a greatest epoch of the prohibited History. Lots of artifacts of the pre-flood history are forbidden by false "fathers" of the mainstreams. Lots of so called "researches" are written for the money, not for the Truth. They could rise lots of money for the falsification of the our real history. "Fathers" of the falsifications led by Dr. Zahi Hawass and Dr . Mark Lehner have the ostrich position against the modern discoveries made by many investigators. These video clips are taken from the interesting investigations and closely interrelated to much more sensational discovery that the Atlantis City. If you know Geology can understand everything! All well-known pyramids of Egypt: “Khufu’s”, “Khafre’s”, “Menkaure’s”, Djoser’s, Meidum, bent and red pyramids are sacred to Atlantis people, to revere souls of the Atlantis people. Additionally the Giza complex exactly indicates the astronomical date of the deluge (22±1 October 10,465B.C.). Thus the Giza complex had been sacred to global deluge in 10,465B.C. as well. Symbolical graves in the pyramids have been sacred to victims, to their souls. The treasures, things and tools in the closed rooms of the pyramids are the heavenly gifts for the souls. Thus the Giza complex is sacred to last global geo-catastrophe as well, which started on 21 October, 10,465 B.C. The Sphinx indicates epoch of the event, i.e. Leo's epoch. Three stars of the Orion's belt indicate the three Giza pyramids at the event boundary and causeway (alpha-omega αώ way ) from the middle pyramid to the sphinx indicates sunrise, i.e. 21-22, 23 October during the event. Of 21 October to 23 October continued EB geo-transfer and terrible earthquakes, runaway subductions, obductions and the global wave deformation of the crust, which formed the last global deluge all over the Earth. The Giza project had been started by survived Atlantians after 10,465 B.C. and finished approximately in 10,400 B.C. Of course the project was interrelated to last global deluge. We have calculated long ego, minimal age of the Sphinx and three pyramids by using scientific researches - 10.400+2010=12.410 years. It has no alternative. Whole Elite of the modern Geology want to say to egyptologist that the Sphinx has the much older age but the egyptologists have the ostrich position ?????? The Egyptology – pseudoscientific field. I’m very sorry but this is the truth. Modern Egyptology is died and needs to be recovered from the new roots. Triumph of the false degrees and false authorities have already produced dead full crisis in the historical sciences as well. Who is the blame? 1. For decades falsification of the mankind’s history by false degrees. 2. Lots of “researches” on ancient history, written for the money, not for the truth. 3. The false dating for the pre-flood (before 10,465 B.C.) and post-flood megalithic constructions. 4. Absolutely ignorance of the geological data in dating for the pre-flood (before 10,465 B.C.) and post- flood megalithic constructions. 5. Non-scientific hysteria in the mass-media against true discoveries on forgotten greatest history. 6. The amazing discoveries by Rene Schwaller de Lubicz, John Anthony West, Dr. Robert schoch, Graham Hancock, Prof. Charles H. Hapgood, William Niven and other intellectuals including my ground breaking investigations. 7. Silence by many Egyptologists about the amazing discoveries. 8. Selective investigations with disappearance of the many unacceptable data. Falsification of the greatest pre-flood and post-flood history, mainly began by first Egyptologists and have come to the extreme limit by the modern Egyptologists led by greatest false-makers and false authorities of the historical sciences: Dr. Zahi Hawass and Dr . Mark Lehner. Restoration date of the pre-flood and post-flood megalithic construction does not mean that the amazing artifacts have been built at the dynastic epoch????? Position by the “Ostriches and ignorantes” have already killed the science and the Egyptology is "rotten to the bones". Everything had been started in 10,428BCE. The last global geo-catastrophe formed by EB geo-transfer. EB geo-transfer produces turbulent streams into E geo-sphere around magnetic nucleus. This is a clue about rapid reversal event of the global magnetic field on the geological timescale. Under the crust the Earth has huge Magma Ocean (Asthenosphere). Approximately deepness of the fiery ocean is measured H= 400 km. Minimal Thickness of the crust over the Magma Ocean ranges 5÷8km. Mantle plumes discovered by many geologists are the proofs about violent liquid streams within the Magma Ocean (B geo-sphere). 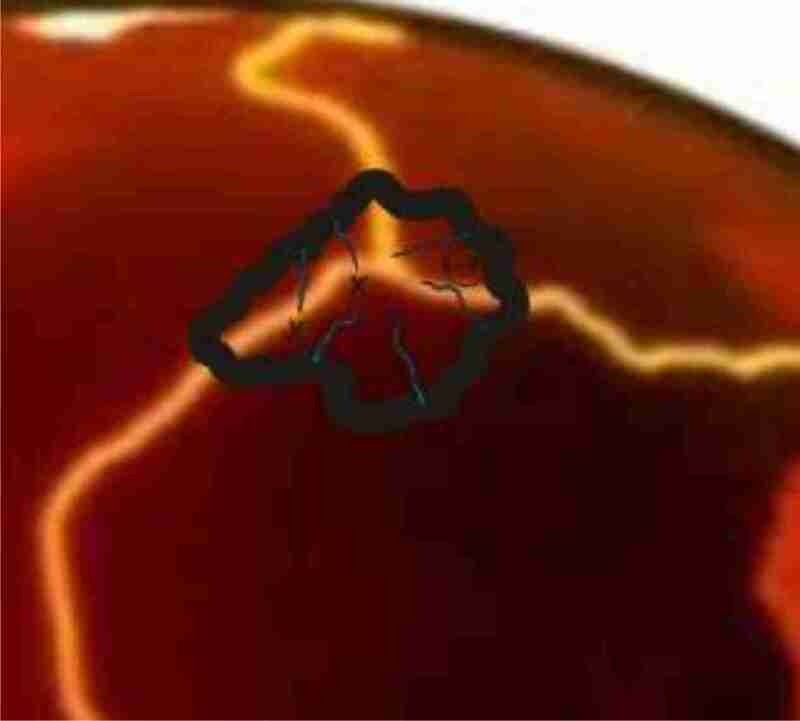 The liquid streams are proofs about penetration or rapid movement from E geo-sphere into the B geo-sphere that is the Magma Ocean (Asthenosphere). 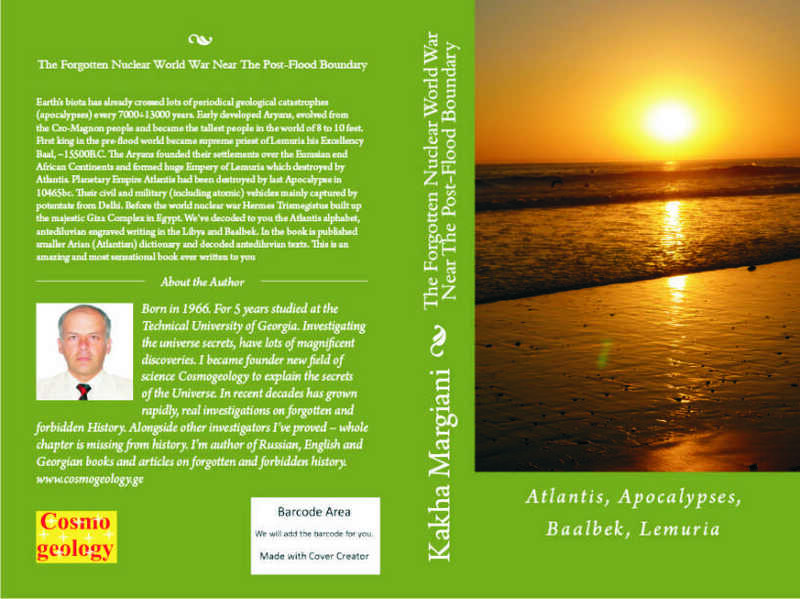 Reversal and recovery of the global magnetic field and kilometers high tsunamis are side effects only. The violent magma streams in the Magma Ocean produces wave deformation of the crust, different faults, runaway subductions, obductions and drifting of the main platforms and slabs over the Magma Ocean ≈1000÷1500km distance. ≈10,428B.C. is a last reversal of the poles (Gothenburg excursion ) discovered by Swedish geologists in 1972. The Swedish reported in "New Scientist" 6/1/1972, p.7, that "a reversal of the Earth's magnetic field occurred 12,400 years ego" which gives 10,428B.C. Now we have olmasyt ixact date 10,465B.C. 10,400B.C.is a last reversal of the magnetic poles acc. Nature. Note: Each excursion has thousands of kilometers long, simultaneously erupted lithosphere layers over the Mid-Ocean Ridges. They are the greatest record-lines of the minimal magnetic intensities (by means of the rapid hardening into the water), to understand detonator force of all global geo-catastrophes after K/T boundary. All rapid reversals of the global magnetic field are the side effects of the EB geo-transfers. These events are the simultaneously processes. This is a clue about global oscillation and wave-deformation of the crust for three days. Within EB outflow zones, under crust pressure increases with increasing penetration through the mantle. Height of the surrounded crust can be increased within kilometers per hour. This is interrelated to global oscillation of the crust platforms, fissure-outflows and the kilometers-high tsunamis. 50-90% of the fauna can die during the event. Rapid global drifting changes coastal lines of the continents, islands and peninsulas. Some islands and peninsulas can be sunken. The event produces new islands and peninsulas as well. The Atlantis secret is a global readjustment of the isostatic balance between lithosphere plates, after the EB geo-transfer. EB geo-transfer produces especially violent outflows through the mid-ocean ridges and ejection and Outflow over the 50.000 km zone is a natural geo-catastrophe. The catastrophic transfer produces lots of new fissures on the scarred sea-floor. The alive boiled water beings can cover surface of the seas and oceans. Giant kilometers high tsunamis - water waves can cover coastal zones and deep interior over the mainlands. Global and intensive evaporation from the warm oceans produces intensive snowfall within the polar zones and rainfall and monsoons in the other zones. for post-flood centuries, global transfer of the evaporated water masses from the oceans to the poles produce kilometers high ice-sheets and temporary dropping of the water level. The periodical glaciations can be formed by the periodical global geo-catastrophes only, during the post-flood centuries. 2.3 10 islands of Atlantis and its Capital! Athanasius Kircher’s map 1669. Kircher was a Jesuit German priest, who lived between 1602-1680. 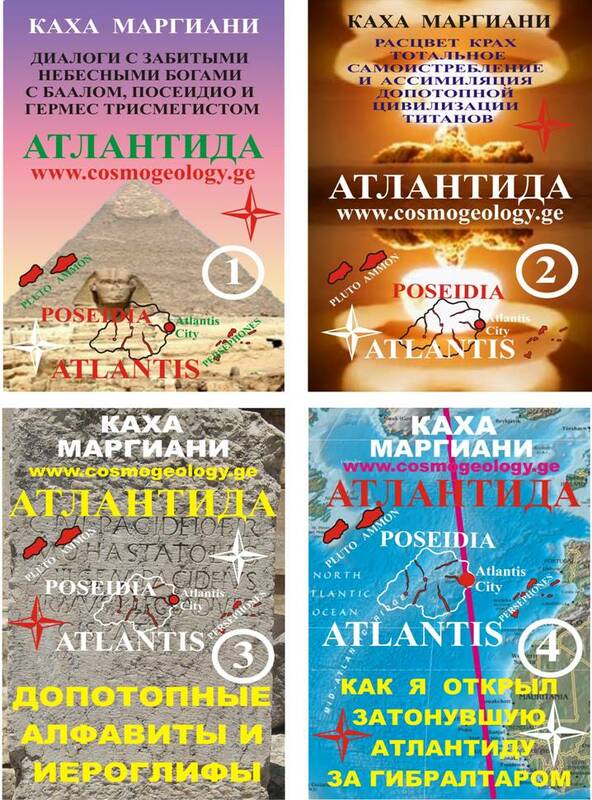 He published “Mundus Subterraneus”, a book containing a map of Atlantis according to ancient Egyptian maps. The original map was taken from Egypt by the Romans, probably around 30 AD. I’ve tried many maps but only Kircher’s map could explain many secrets. I want to say that the map, due to lots of copies during the difficult millenniums, maybe is stretched slowly but exactly indicates on sunken terrain. Of course the Kircher’s map is an interesting and much more plausible. the plausible map near to the truth as well as the decoded map by me. 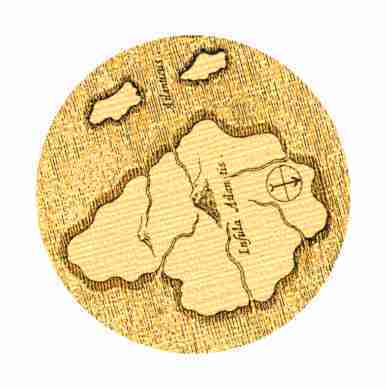 Outlines of the main three islands on the map are approximately but the map shows almost real territories of the sunken kingdom. Eastern part of North America was uplifted by the catastrophic interaction between the lithosphere platforms, during the Aquarius global deluge in 22,440B.C. and the coastal zone was very different by comparison to the modern maps. The line to the mainland shows pre-flood coastal zone of the uplifted platform after the global drifting in 22,440B.C by catastrophic global interaction between the lithosphere platforms. Disappearance of the Great Britain and approximately outlines of the eastern continental platforms has an interesting explanation. Much more attention had only Atlantis Isles for the ancient geographer. A geographer did not forget even the volcanoes and rivers. Coastal lines are painted especially attentively. We can observe even pre-flood bays (2.1 2.2). The Atlantis isles were formed by huge pressure of the surrounded thick platforms (3.1 3.2). 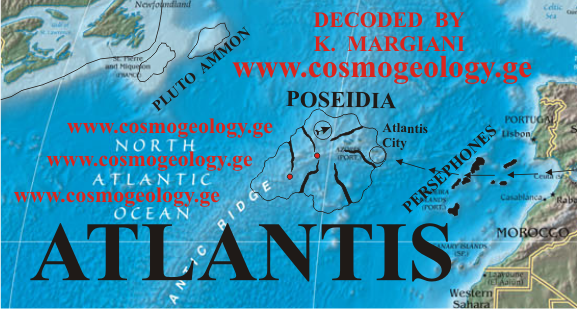 Atlantis as a marine power and planetary Empire had an influence all over the pre-flood world. Yonaguni-Sima, Easter Islands, Andes, Yucatan, Egypt, Mesopotamia, India and many other places have the Atlantian-tracks. Prof. Charles H. Hapgood said greatest truth: “there had been early developed ancient mother culture, which had contacts to the all other developing cultures all over the Earth”. 3.1 3.2 The real Atlantis fracture zone on the scarred floor. The arrow at the corners shows direction of the pre-flood and modern magnetic fields. the pre-flood direction is not correct but is a proof about the Atlantians knowledge. Two mountains on the Kircher’s map represents two volcanoes. The arc-lines from the peaks of the both mountains, on the Kircher’s map show simple volcanic activity. 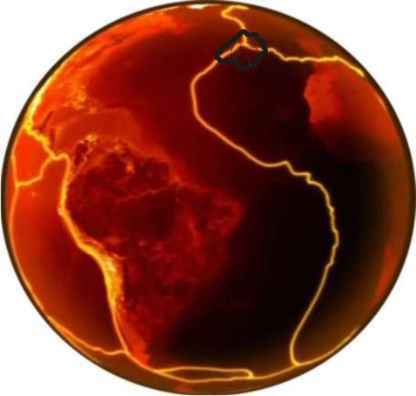 Both volcanoes (X) are on the Mid-Atlantic ridge. strange would be the fault zone without volcanoes.The uplifted ridge without the volcanoes would be much more unbelievable. Huge outflows over the Mid Atlantic Ridge in 10,465B.C. could change the volcanoes coordinates as well. The new fissure outflow zones at the boundary are crossed by pre-flood rivers. (3.1) Some small lithosphere slabs at the fissure boundaries are broken out by ejected magma masses (5.1). directions of the rivers from mountains to the coastal zones are plausible. we can understand the modern Exact coordinates, where the fourth river was flowing (4.1) to the pre-flood bay between the two mountain chains - Latitude: 33O 31I N, Longitude: 28O 42I W.
1. Left peak – Latitude: 36O 51I N, Longitude: 14O 26I W.
2. Middle peak – Latitude: 37O N, Longitude: 14O 10I W.
3. 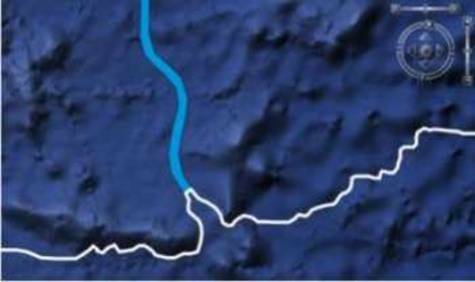 Right peak – Latitude: 37 O02 IN, Longitude: 13 O52I W.
At the moment of the huge island discovery Poseidon’s people was well developed race. The people could build ships and had the amazing stone-processing technologies. "Poseidon carved the mountain where his love dwelt into a palace and enclosed it with three circular moats of increasing width, varying from one to three [Atlantian-Egiptian] stadia and separated by rings of land proportional in size [Central mysterious point on the map - 7.1 (-25,03 : 37,40)] itself surrounded by mountains. The Atlantians could build bridges northward from the mountain, making a route to the rest of the island. They dug a great canal to the sea (Atlantic Ocean) due south, and alongside the bridges carved tunnels into the rings of rock so that ships could pass into the city around the mountain; they carved docks from the rock walls of the moats. Every passage to the city was guarded by gates and towers, and a wall surrounded each of the city's rings. The walls were constructed of red, white and black rocks quarried from the moats, and were covered with brass, tin and the precious metal orichalcum, respectively." 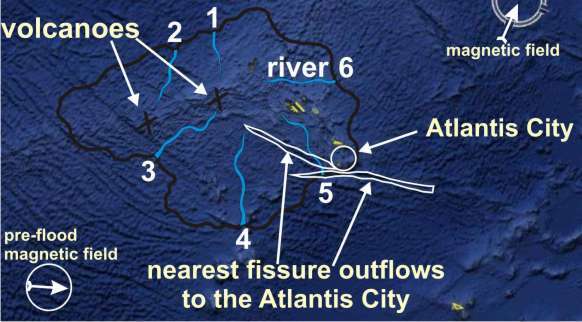 Fissure-outflows and fracture zones at the Atlantis City. The City had been built on “the central (volcanic K.M.) island (at the plate boundaries on the rift zone by the asthenospere surface K.M.) itself was five stades (1-stade [Egyptian-Atlantian] =100-stadia) in diameter [5x205=102.5km] “There are a few places on Earth where igneous asthenosphere comes sufficiently close (5-8km) to the surface. 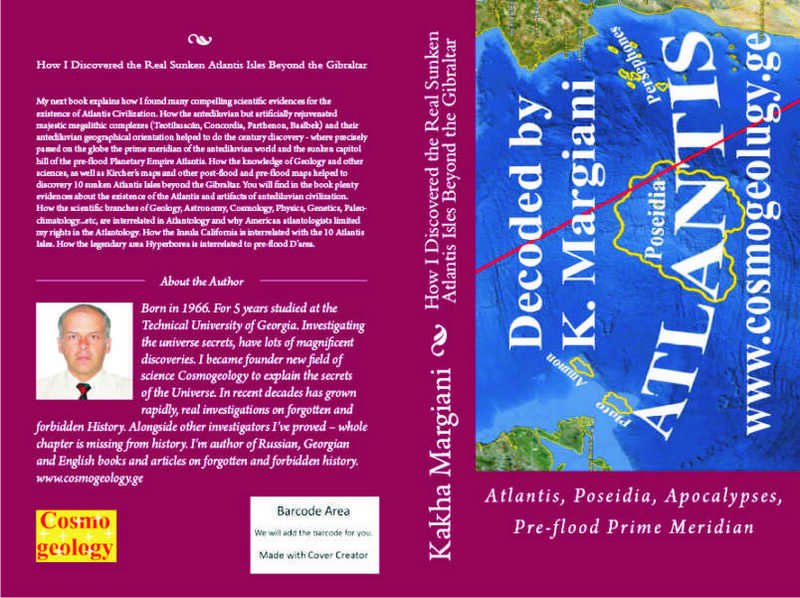 -Atlantis situated near the steep coast. -capital of Atlantis was surrounded by several walls. -The capital of Atlantis was surrounded by three harbors and there were many ships. - In Atlantis isles reigned 10 kings simultaneously. -Atlantis used gold goblets for drinking during ceremonies. - Atlantis is the main source of all ancient fairy tales and myths. - In the capital of Atlantis there was a grove of Poseidon (Crit. 117b) and the temple of Poseidon consisted of gold, silver, ivory and orichalcum (processed copper’s surface with imitation of the gold). In the temple was monument sculpture Poseidon standing in a chariot drawn by six winged horses (hint about six river of Atlantis), surrounded by dolphins. " 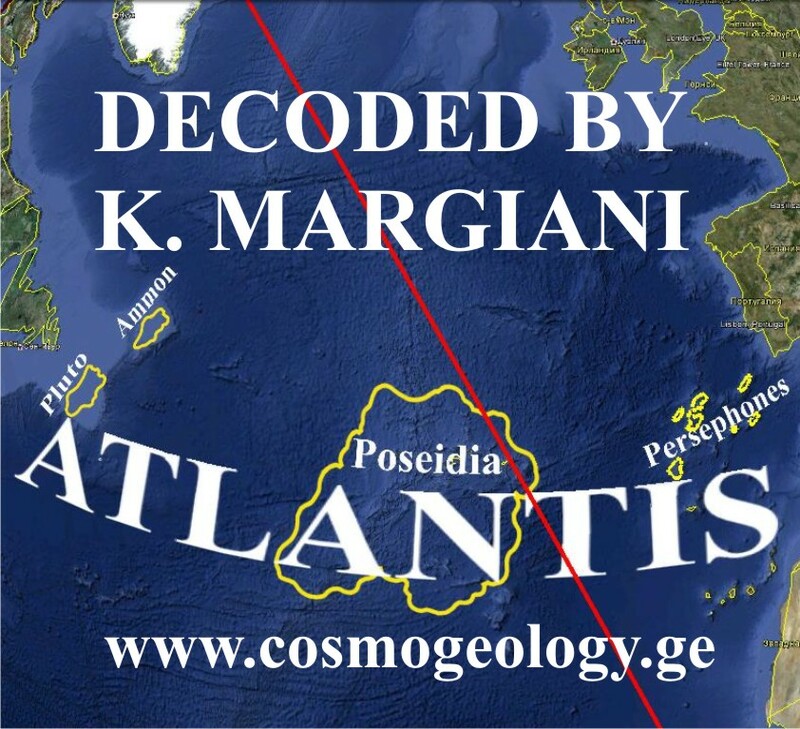 Thus, if Atlantis City really ever existed, modern coordinates of the golden temple which lies beneath the ocean are found: Latitude: 37O 16I N, Longitude: 25O 03I W.
According the encyclopedia the Santa Maria Island was formed 4.8 million years ago. Geologicaly the Santa Maria is the only island in the Azores with an abundance of sediments. It is in these sediments that marine fossils have been discovered. 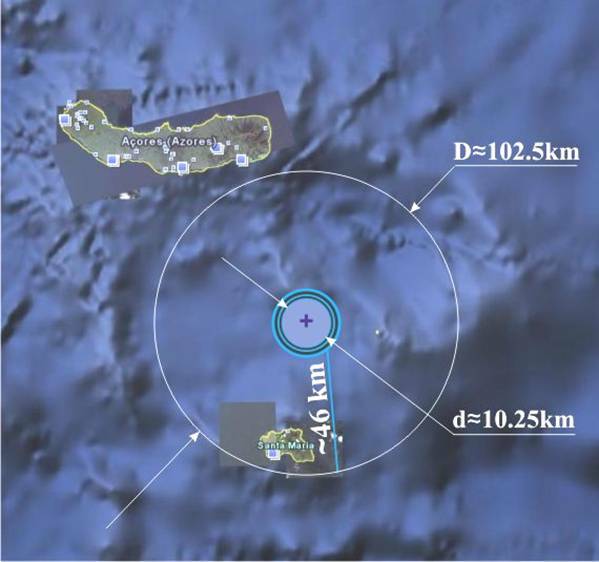 The Santa Maria Island did not show violent volcanic activity by comparison others. This is a conclusive evidence. The island by the surrounded and destroyed floor material was formed. 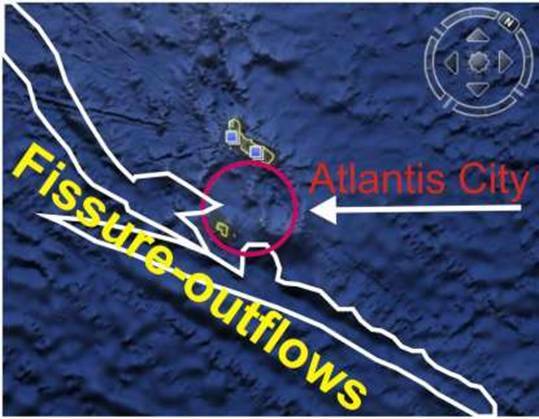 Only fissure ejection explains puzzles of the Atlantis remains. In Azores (has 12 volcanoes) a volcano rose suddenly in 1808 in San Jorge , at a height of 3500 feet. It burnt for 6 days and desolated the whole island. In 1811, near Sao Miguel, another volcano rose creating an island 300 feet high. The place was called Sambrina , but it soon sank again. Other similar eruptions took place in 1691 and 1720. there were a lot of strongest earthquakes and volcano eruption during last centuries within the Azores Triple Junction zone. Still the sunken Atlantis land is an active zone. 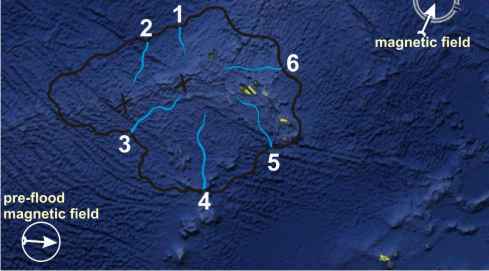 Within pre-flood period Atlantis had two main active volcanoes and there are 12 now. Along the Atlantis triple junction where the boundaries of three greatest tectonic plates. There are many submarine volcanoes as well. 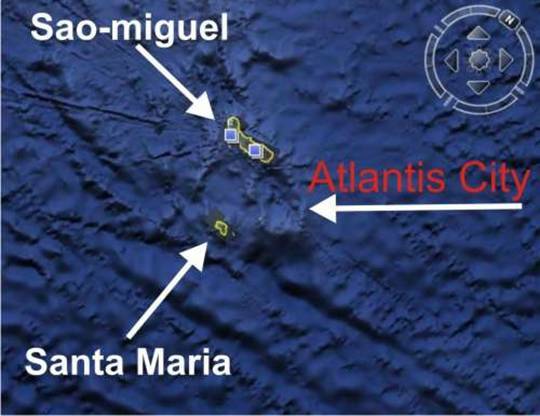 The sonar image clearly shows that overfolding structure under the Santa Maria by the fissure outflow zones is surrounded. Thus the Santa Maria Island is an uplifted and destroyed crust and formed by sedimentary layers. Violent fissure outflows in 10,465B.C. can explain abundance of sediments. 4.8 million years are interrelated to geological age of the destroyed floor debris only. Scarred terrain of the floor shows lots of fissure outflow zones as well. Scientists are right; Caribbean and Bahamas islands within last pre-flood period were much wider. It connected to the uplifted floor especially to the Triple Junction (Atlantis fault) zone within last pre-flood epoch. 6.1 6.2 A spokeswoman for Google said: "It's true that many amazing discoveries have been made in Google Earth including a pristine forest in Mozambique that is home to previously unknown species and the remains of an Ancient Roman villa. 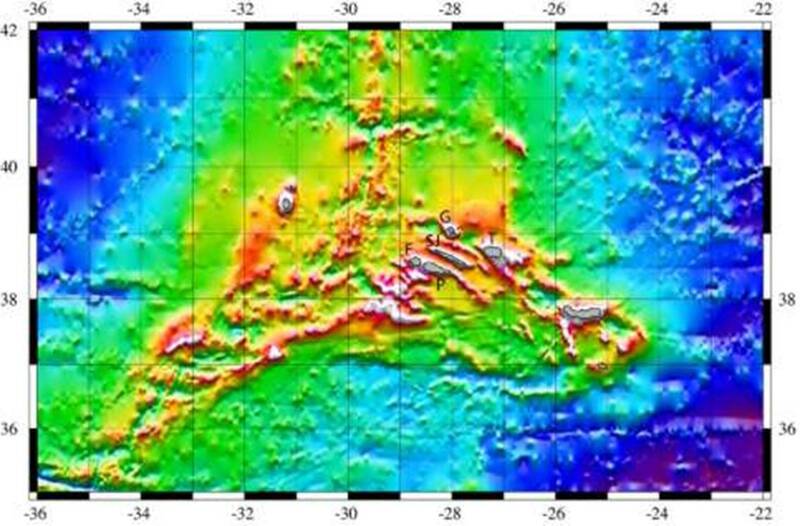 Sea floor terrain data is often collected from boats using sonar to take measurements of the sea floor.” I think discovery of the Atlantis City is an unbelievable but much more important event. The fact that the Atlantis City still lies below the waves and how little we really know about the world's oceans. For the open-minded people we have discovered next important conclusive evidence, Prime meridian of the pre-flood world. "mountain not very high on any side. (-25,03 : 37,40) . The link indicates that the diameter of the central hill D=10 km (man-made island within sunken citadel - 50 Egyptian-Atlantian stadia). Thus 5 stadia (~1km) is too small for the pre-flood political and economical center. 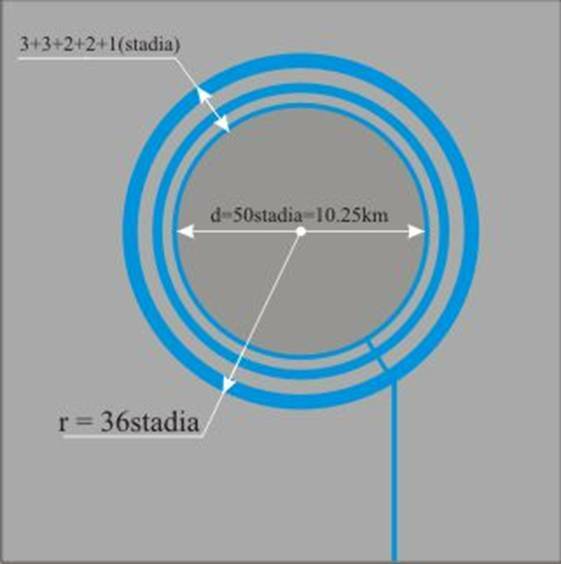 In another case (5stade=500 stadia ) that connected to the whole (~100km) island of the Atlantis City kingdom. The Google map indicates an arc, remain of the water and ground rings around the sunken citadel and the sonar image vividly show remain of the pre-flood canal from the pre-flood harbors to the Ocean. 1. Are you a left-handed? 2. Do you have a haplogroup X1*; X1a; X1b;MtDNA, R1a; Y-DNA? 3. Are you a long-fingered and have a longer hand? Even one sign means that you are the assimilated generation of the natural pre-flood race from Atlantis!